Secunderabad wore a festive look as thousands of devotees thronged the famous Sri Ujjaini Mahankali temple and several other Mahankali temples on Sunday on the occasion of Bonalu festival. 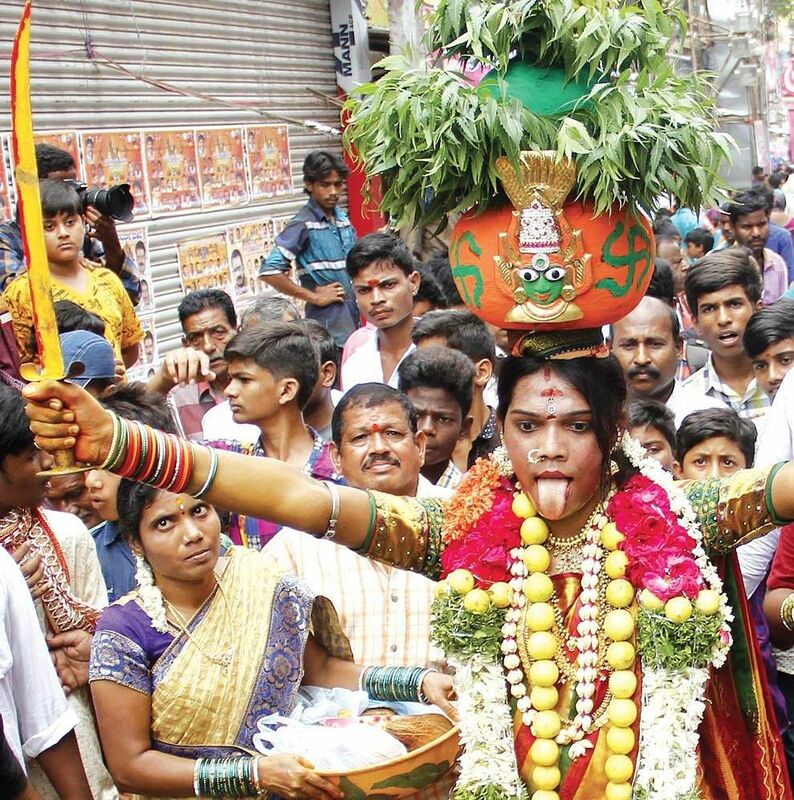 HYDERABAD: Secunderabad wore a festive look as thousands of devotees thronged the famous Sri Ujjaini Mahankali temple and several other Mahankali temples on Sunday on the occasion of Bonalu festival. Lashkar Bonalu began on early morning of Sunday with a large number of devotees, especially women dressed in their best traditional attire with ‘Bonams’ (a pot carrying rice, turmeric powder, jaggery and curd and covered with neem leaves and a lamp placed on it) on their heads and offered to Goddess Mahankali at various temples in Secunderabad. ‘Pothrajus’ and ‘Ghatams’ accompanied by teen maar drumbeats and Telugu folk songs reverberated in various areas of Secunderabad. The temples were also decked up for the festival with special illumination buntings and festoons. The lanes of Secunderabad were filled with processions of devotees and carrying of ghatams. Devotees from the surrounding districts too visited the Sri Ujjaini Mahankali temple and offered prayers. Separate queues were made for the convenience of devotees carrying bonalu, and handicapped and aged persons. Water sachets and prasadam were supplied free to the devotees. City police made elaborate security arrangements for smooth conduct of the festival. Governor ESL Narasimhan, Union minister of labour and employment, Bandaru Dattatreya, chief minister K Chandrasekhar Rao’s wife Shobha, ministers Nayini Narasimha Reddy, T Srinivas Yadav, Indrakaran Reddy, T Padma Rao, PCC President, Uttam Kumar Reddy, MPs, K Kavitha, Malla Reddy, Nandi Yellaiah, GHMC mayor, Bonthu Rammohan, GHMC commissioner, B Janardhan Reddy, city police commissioner, Mahender Reddy, Badminton player, PV Sindhu, MLAs and MPs and others offered prayers at Ujjaini Mahankali temple. The festival will conclude on Monday with Rangam by a young unmarried woman, will be performed at 9 am on July 10 followed by a procession of Mahankali Goddess on an elephant in surrounding localities of the temple. The devotees also thronged different Mahankali temples located in the Ramgopalpet, Pan Bazar, Mettuguda, Bhoiguda, R P Road and M G Road, Paradise, Ranigunj, YMCA which wore a festive look.